Merlix is a wizard-like Super Assault Bakugan, who is a Dice Thrower. It bears resemblance to Mystic Chancer, Coredem, and Primo Vulcan. Merlix is a massive brawler that wears a nearly indestructible cloak and has a dice that decides the attacking Attribute. He knows what the opponent thinks and can confuse the opponent by creating a hallucination that captures opponent's thought. The Darkus version's highest G Power is 750/700/700/650/600/550 and the Pyrus version's highest G Power is 750/700/680/600/580/550 as well. You can find the Pyrus version in a battle pack. An Aquos Merlix shall be released in Wave 4 with 950 G on the die. It is also available in Subterra. 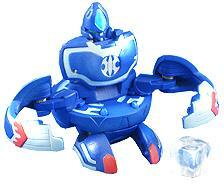 Purchase your Merlix Bakugan from Amazon now!